Kaltman Creations, makers of the Invisible Waves brand tools for handling wireless interference, has announced a solution to the RF congestion and “spectrum squeeze” issues that have plagued the pro audio industry in recent years. “We secured the rights and ownership to advanced filtering technology that was previously used in military, nuclear plant, and critical data communications, and adapted it for the UHF bands used in pro audio wireless," said Kaltman Creations president Mark L. Kaltman. The company's new RF-ResQ (Receiver Enhancement System) is an antenna signal processor that can rescue and salvage unusable RF spectrum, substantially reduce interference and more. Housed in a rugged, single-rackspace unit, the RF-ResQ is the world’s first standalone wireless microphone filtering system employing multiple military-spec, high-Q bandpass filters. ResQ will clean up the received RF spectrum, allow for closer adjacent channel spacing (potentially doubling available channel counts without sacrificing power), remove the issue of intermodulation effects, and improve the reception of weaker transmissions. RF-ResQ's onboard eight-channel antenna distribution amplifier with RF router allows its filters to adapt to various receiver and distribution configurations. This provides one filter/frequency per receiver channel, which ultimately means that the user's receiver only sees its assigned transmitter frequency and nothing else—with no out-of-band RF interference to bog down or desensitize the receiver’s input. Alternatively, users can select "combined signal routing" to feed integrated receiver/distribution systems, as found in some newer digital mic systems. DiverseQ, the RF-ResQ's new antenna diversity technology, pre-filters the antenna A/B signals in the IF stage for fast, accurate, and quiet antenna switching. This improved, "best signal detection" function is performed within the RF-ResQ, so there's no need for a two-antenna connection at the receiver input. Installed between the antennas and receivers, the RF-ResQ works with industry-standard antennas, in analog and digital wireless mic systems in the 470 MHz to 928 MHz range; one model—worldwide. 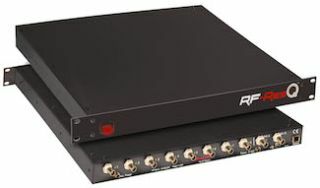 Frequency, gain, and routing assignments are easily performed via a LAN or USB/laptop connection to the rack unit. With its router capability, the RF-ResQ can be used either as a direct replacement for, or in conjunction with, an existing antenna distribution system. For more information, before/after RF Spectrum images and demo software, go to www.KaltmanCreationsLLC.com.